Around the velodrome, the Canadian team is well known for its women's Team Pursuit squad, having stepped on the podium for the last seven consecutive international competitions, including a bronze medal at the 2012 Olympic Games. But another group of endurance Canadian track cyclists is making some important progress as it tries to qualify for the Olympic Games in Rio: the men's Team Pursuit. The group that competed in London is comprised of veterans Rémi Pelletier-Roy (St-Augustin-de-Desmaures, QC) and Ed Veal (Queensville, ON) joined by rookies Aidan Caves (Vancouver, BC) and Sean MacKinnon (Hamilton, ON). In addition, youngsters Eric Johnstone (Calgary, AB) and Alec Cowan (Calgary, AB) are also integral parts of the program, and the team is continuously improving their times and posting better results. For Ian Melvin, coach of the Canadian men's endurance program, the continued progress is critical for the full development of the program. "This has been yet another successful opportunity for the boys to step out and perform on the international stage. Although sometimes it's hard to see the progression that we are making, we've made steps at every level. We are gaining time on all our Americas counterparts and all the nations in the world. These are really encouraging signs for the future." 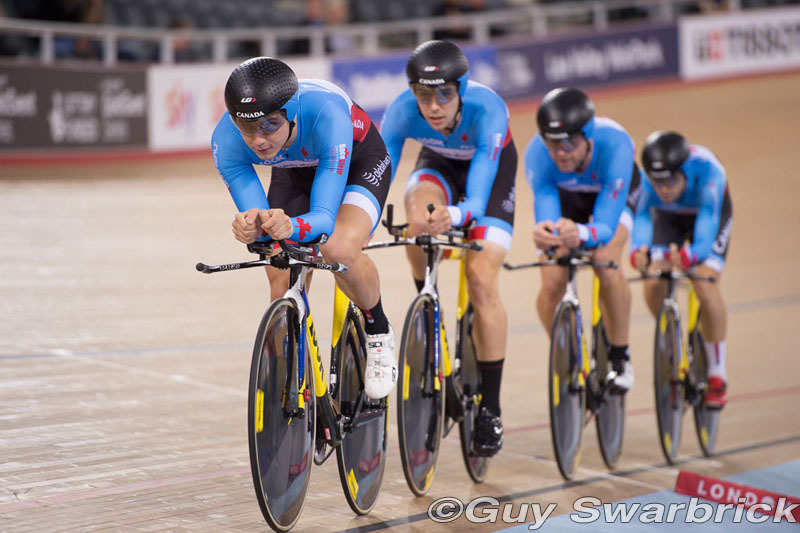 Canada just recently re-launched its men's Team Pursuit program, and every race is an opportunity to gain valuable experience that helps the team improve its international ranking on the journey to Olympic qualification. And every race also helps to teach the young team about the commitments it takes to reach that objective. Melvin: "The whole experience has been very positive. The boys are coming into this environment, and they are starting to act like they belong here. Most pleasing was to see the progression that we are making. When you train in isolation as a unit, it's often hard to see where the gains are happening. Coming here and seeing the hard work come to fruition is a great positive outcome for us." The riders have invested a lot of time to build the men's program from the ground up, participating in multiple training camps throughout the last year, in addition to doing road cycling blocks in Europe. The men's team pursuit members left London on Sunday, heading to Malibu where they will participate in another block of training prior to a possible participation at the next World Cup in Columbia.